Matilda's recent field trip to the farm with her class reminded me how long it has been since Porter has gone. That, combined with the fact that the u-pick strawberries are ready, spelled a trip for us this week. When I told Porter where we were going Thursday morning, he got all excited and asked if we were going to ride the school bus there? Poor boy is so ready to go to school too, like his big sister! One fun new thing added this year to the farm is a crank conveyor belt that brings a cup full of the feed up to a waiting goat on the goat-sky-walk. I did not bother buying any food because Porter was perfectly happy to just crank away, feed or not. It was a bit sad to watch to goat though as he got a little hopefully anytime a kid would wander by to crank it, and then the goat would return to looking sad/tired/bored as it realized the cup was (yet again) empty! Once we headed out into the fields to pick, Porter was happy to take charge of pulling the wagon and his friend, G.
What a nice, big smile! 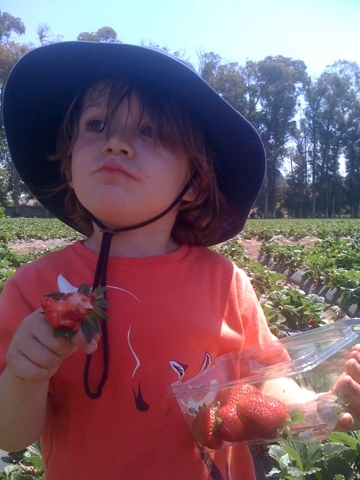 The strawberry picking was the best I have ever experienced. There was lots of ripe, delicious berries and we filled all our buckets super fast, regardless of the berry-vacuum-boy that came along too. We also picked some radishes and dug up potatoes, which the kids both really enjoyed. Matilda was even a little jealous of the potato digging so I see another trip out there in our near future. Only 12 more days of kindergarten until summer adventures begin!